The Danby DDR5009REE is a powerful medium capacity dehumidifier suitable for use in a basement dehumidifier or in other areas of the home. The DDR5009REE has a lower moisture extraction capability than the 70 Pint DDR7009REE and 60 Pint DDR6009REE and will be a better choice for a smaller basement, or room, as its energy consumption is less than the two more powerful models. The Danby DDR5009REE is an Energy Star® qualified model which has been widely praised by consumers in many reviews. There is no doubt that this unit will control basement humidity effectively and prevent the growth of allergen producing mold and dust mites as well as protecting your home and its contents against condensation and damp. Users comment favourably about the high build quality of the Danby DDR5009REE, the ease of use provided by its electronic controls, the convenience and effectiveness of the continuous drainage option, the reassurance of the auto-restart feature and the broad range of humidity within which the humidistat can be programmed. The only complaint made in a significant number of user reviews is about the noise level produced by this model, particularly when the higher fan speed has been selected. In comparison with other models in its class the Danby DDR5009REE is neither exceptionally noisy nor remarkably quiet. Unfortunately more powerful units tend to be louder than lower capacity models and its other qualities are seen by most to outweigh this one disadvantage. If having the quietest dehumidifier is an over-riding priority the DDR5009REE may not be the best choice but in every other respect we feel able to recommend this model with confidence and believe that it offers good value for money. The DDR5009REE is portable having castor wheels for easy movement across the floor and handles on each side to lift and carry the machine as required. These appliances are never truly light but at just under 36lbs this machine is not too taxing to move for most of us. It is also pleasingly compact and will fit easily into small areas in a home where floor space is limited. The Danby DDR5009REE has an adjustable humidistat incorporated into the design. This is an energy saving feature because it allows the user to pre-set the level of relative humidity (RH) s/he prefers and ensures that the compressor does not run once this level is achieved. This contributes to the overall energy efficiency of this unit. Dehumidifiers with a humidistat have to sample the air to sense the level of relative humidity in order to "know" when to restart the compressor. Some do this by running the fan for a few minutes every hour or so while others, like the DDR5009REE, run the fan continuously. Some users dislike continuous fan operation, although it is the more reliable of the two methods. Prospective purchasers should be aware that this is the way the DDR5009REE operates before selecting this model. The humidistat also prevents excessive drying of the air which can be uncomfortable for people and damaging for their possessions. RH of around 50% will be sufficient to prevent mold and mildew growth, to deter dust mites and eliminate condensation (except in very cold weather) and should be pleasant to live with. The Danby DDR5009REE also has an auto-defrost function. It sometimes comes as a surprise to people that their appliance has stopped working because the coils are covered in ice. The coils are refrigeration coils, like those used in a kitchen refrigerator, cooled to a low temperature to condense water from the air. As such they are prone to ice up in any temperature from about 65° downwards. Auto-defrost detects the formation of ice and switches off the compressor. The fan will continue to run and the flow of ambient air will melt the ice. This feature is included primarily to protect the appliance. Clearly the cooler the ambient air the slower the thawing process will be. In temperatures below 60°F any portable will become progressively less effective. For this reason a model such as the DDR5009REE is not suitable for use in conditions where the ambient temperature is below 60°F for long periods. It is worth noting here that the maintenance required is minimal but necessary. First, the air filter should be cleaned, by light dusting, vacuum cleaning or washing (in the case of washable filters) every couple of weeks. The refrigeration coils will need cleaning about once a year. Dust and other debris coats the coils over time and increases the probability of ice formation. This is one of the main reasons that we read in so many reviews the phrase "...my last dehumidifier died on me...". The DDR5009REE has another useful feature, continuous drainage. When you switch the machine on for the first time (don't forget to let it stand for the recommended period) the condensate will drain into the water collection container and will need to be emptied periodically, possibly a couple of times daily. If you forget the machine will stop, so no puddles, but while it is stopped it is not doing its job. Continuous drainage means that the condensate can be run, via a small plastic hose, to a nearby water outlet, a drain, sink etc. This feature spares you the chore of emptying the bucket and is great for people with fallible memories. You will find that this option works more effectively if you are able to mount the appliance a foot or so above floor level. The DDR5009REE is equipped with with soft touch electronic controls. Users report these are intuitive and easy to use. A remote control is also included for added convenience. This will operate the appliance from a range of up to 16 feet. The DDR5009REE offers a choice of two fan speeds. On first use it will almost certainly be necessary to run at the higher speed to reduce excess humidity. Once the moisture level is at a reasonable level, however, the lower fan speed may be used to maintain it, with the benefit of lower noise output. Please note, however, that if the area in which you are using the unit is close to the upper limit of it's capacity this may not apply. If this is the case a more powerful model would be preferable. The DDR5009REE also incorporates a 24 hour timer which you may find useful if you want it to operate at a time when humidity peaks, such as when everyone is taking showers, but to switch itself off after the time when everyone has left the house. It also includes an auto-restart feature which will switch the unit on again following a power outage. As with the two more powerful models consumers are unanimous in praising the effectiveness of the DDR5009REE. It pulls mositure from the air effectively and maintains relative humidity at the chosen level to prevent mold and condensation. Some users dislike the fact that the fan runs continuously, a point we have adressed earlier on this page. Doubts have been raised about the accuracy of the humidistat. Danby state that the humidistat is accurate to +/- 5%. This is typical of portables generally and we recommend monitoring relative humidity with a separate hygrometer and adjusting the humidistat accordingly. Many users have commented on the ease with which the bucket may be removed and replaced although some have complained that the bucket is not sufficiently robust. Those who have used the continuous draiange option are pleased with the effectiveness of this feature. The issue of noise from this model has been mentioned earlier and complaints about noise are common. Generally consumers are happy with the reliability of the Danby DDR5009REE although a small number have found their unit to be damaged on arrival or have experienced faults within a few months of operation. 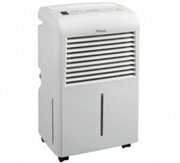 Our considered view is that the Danby DDR5009REE is among the best dehumidifiers for use in a basement. Its overall performance and reliability are more than satisfactory. For those for whom the noise level is not the most important issue we recommend the Danby DDR5009REE Dehumidifier with confidence.